Skidaway Institute scientists Jens Nejstgaard, Stella Berger and Zachary Tait were part of a team of 30 scientists from more than ten countries collaborating on a paper published recently in the scientific journal PLOS ONE. 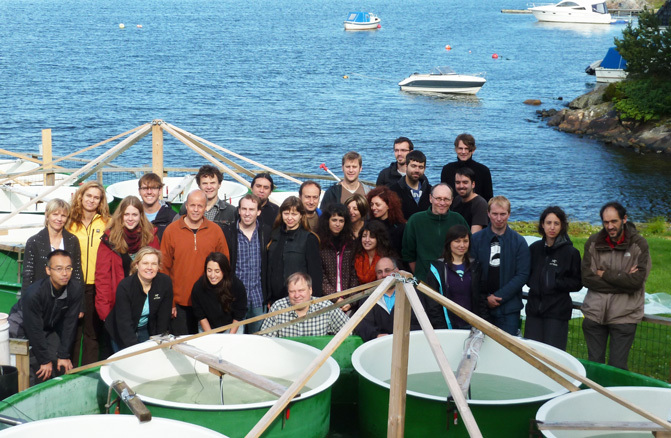 The science team at the mesocosm facility at Bergen, Norway. Stella, Zach and Jens are in the back row on the far left. The scientists studied the effects of future climate change scenarios on plankton communities of a Norwegian fjord using a mesocosm approach. Natural plankton were enclosed and treated with inorganic nutrients (eutrophication), lowering of pH (acidification) and rising of temperature (warming). Acidification and warming had contrasting effects on the phenology and bloom-dynamics of autotrophic and heterotrophic microplankton. The development of mass balance and proportion of heterotrophic/autotrophic biomass predict a shift towards a more autotrophic community and less-efficient food web transfer when temperature, nutrients and acidification are combined in a future climate-change scenario.